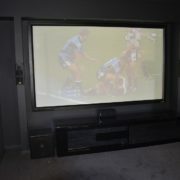 One of the biggest mistakes homeowners make when allowing for a home theatre room or what a lot of architects are calling it is a media room. There is very little to no thought about the sound waves that affect the theatre room or other room in the house and how soundproofing and acoustically treating the theatre room can reduce the effects and improve sound quality to simulate real world audio situations in the movie. 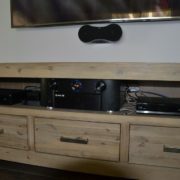 Just as a church or a concert hall have different acoustic properties, so does your home theatre room. 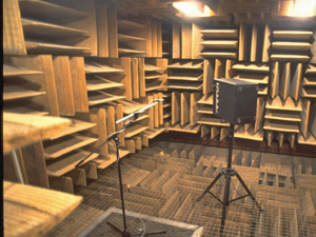 Both soundproofing and acoustic treatments are different things but still, both are important to know about and what levels of effects are possible to achieve. Just a quick note, if you ask a gyprock installer, odds are they’ll know little to nothing about acoustic treatments, so further homework is required, this blog is a great start. We’ll start with soundproofing (what most people would know and heard about), in its most basic form, it can be a matter of purchasing sound proof insulation, it is denser than regular insulation, then gyprock straight on top. It will work, but overall the result will be insignificant, for adequate sound proofing more work is required. There is special soundproofing gyprock you can purchase in different thicknesses, and within that, there are varying levels of soundproofing gyprock solutions, more importantly, different fixings are required and techniques in regards to installing it all. For a decent soundproof room, a double wall design is necessary with an air space between, like soundproof glass in high-end motels room or an inner-city apartment building. This level of work will eliminate nearly all sound waves, especially bass sound from travelling along timber framework that vibrates the walls, that’s how sound moves into the next room. 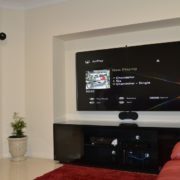 More information about products can be seen at https://www.usgboral.com/en_au/solutions/plasterboard-systems/cinemazone-sound-reducing-system.html or http://www.gyprock.com.au/Pages/solutions/homes/noise.aspx or http://www.soundprooffoam.com/Guide_to_Soundproofing_a_Killer_Home_Theater.html this is an American site but give examples of sound proofing products used. Now secondly, acoustic treatment is the next level up and is something not many people know about but more importantly is required for quality sound. 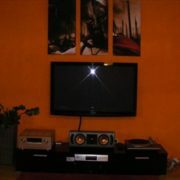 This is where the difference audio quality will be noticed in the room. What happens in a normal room is sound wave bounce off all the wall, like in a large church (same in theory but nowhere near as bad in practice). If you clap your hands in the room and pay close enough attention you can hear a slight echo, that’s the sound waves bouncing off all the walls and then get to the ear; it can sound unnatural, and be amplified with hard surfaces like a timber or tile floor. With acoustic treatment you can clap your hands and the echo will dramatically decrease, the sound will be much clearer, and when done right, the entire room will have a different sound to it. 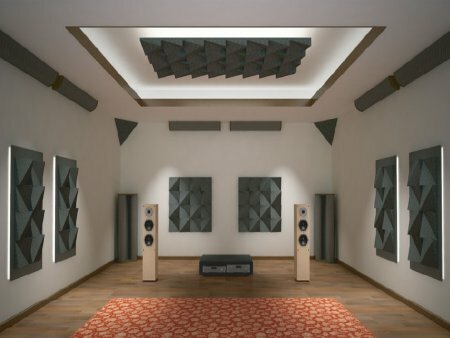 To achieve a great sounding home theatre room, different types of acoustic diffusers and acoustic absorbers along with some bass traps need to be installed, so what is all that you say. Well, acoustic diffusers are just that, to diffuse the sound waves, to scatter the sound waves in more different angles than a flat wall, something with lots of different shapes. An acoustic absorber will absorb the sound waves like soundproof insulation, and a bass trap is a device that grabs the bass sound that is jumping about the room and absorbs it. With home theatre systems moving from 5.1 to 7.1 and 7.2, acoustic treatment in our opinion is extremely beneficial to produce a sound effect that is more realistic and will “blow your mind”. 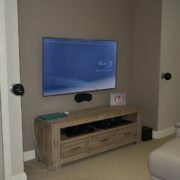 With saying all of that there are specialist companies that install acoustic treatment solutions and one manufacturer is Primacoustic, more information and a list of installation company can be found at http://www.primacoustic.com/ is an American website but is full of useful ideas and demonstrates the effects of sound waves in a room. For those that want even more information, we have found this great YouTube video interview at www.youtube.com/watch?v=raAyF5ksbkk this interview will go deeper then what we have here about acoustic treatment. We have just scratched the surface, the video, as well as the website links, will also show you ways to do it yourself which we would highly recommend as the bare minimum. One last note with soundproofing and acoustic treatment, please be aware that when going ahead with this, for best results a qualified installer should be used. There are low frequencies, high frequencies and “standing waves”, many other things to take into account as well that a professional will know about, they will do all the maths to deliver the best results, every room will be different and different treatment are required to achieve the perfect room. 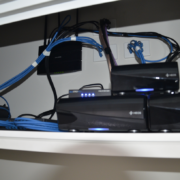 Also, you don’t want all the hard work you’ve done destroyed when the electrician installs the lights, power points, switches and the air conditioning guy puts in the ducts. If that is not done right you can hear the wind blowing around from within the ducts as well as the sound from the theatre room escaping to different rooms of the house (this is going to the extremes now), in regards to soundproofing this may sound like no big deal, but the tiniest of hole can ruin an entire installation. So it is imperative that all trades working in the theatre room knows what they can and can’t do and more importantly what extra precautions each party have to take. So in conclusion, for a home theatre room that will “ROCK”, sound proofing the room first, this will allow the volume to be turned up to an enjoyable level. Then install acoustic treatment materials, this will enable you to enjoy the experience as well as appreciate your home theatre system much more then as if the treatment was not done. 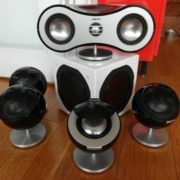 The result will be a home theatre room that will be an envy of all you family and friends.